I have been contemplating this whole project 365 thing ..... I finally decided tonight to give it a go. BUt some of the days this year have just had far to many photos to pick one to represent the day - so I thought a collage might do. 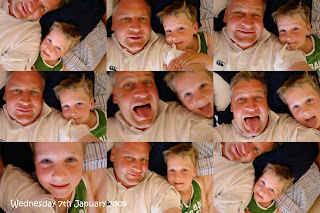 Problem being I still hadn't figured out how to do a collage in Picasa - but as you can see below I have been 'playing' tonight and here you have it .... my collage shot of Wed 7th January - my boys playing silly buggers with the camera!! LOL! Have added the date in Picasa - have chosen a font I like and will stick with this. Have setup a separate folder to put photos in, so I can upload to USB stick and take in to get printed when I am heading into town. Going to spend some time tomorrow looking at the journalling blocks etc that I downloaded from Becky's blog - then I should be away racing! Still have to order the page protectors though, but not vital to have them all now. Other big news, I am now childless - well for the next few days anyway. The kids have gone up to have another holiday with my inlaws in Alex, they will be home on Tuesday. Is so strange being at home without them, but I am going to enjoy my next few days of uninterrupted sleep in's, breakfast in bed, maybe a meal out (or two), and then on Monday when hubby is at work - maybe a whole day of scrapping!! Now that deserves a big WOO HOO! what a great idea... hadn't thought to do a picassa collage on the days i had too many pics to choose from... one note about the date... make sure it isn't too low... i printed mine out and half the date was cut off (on the warehouse printing machine) so watch out for that... luckily only 15c each!!!!! as all wasted!!! enjoy the day of scrapping!!!! Have fun being childless ... OMG, dining out, with no kids [twice] - wow, go you. Now if you can send me a note and tell me how you put the date on your pic in Picasa, well that would be brilliant. Childless ... I wish! Enjoy your sleep-ins and a whole day scrapping ... bliss. Wahoo alright being able to sleep in and only yourselves to worry about! Enjoy! Looks great Mich! Wow childfree days!